Butter and flour 24 (4-ounce) ramekins. In large saucepan over medium heat, melt butter. Stir in flour; cook about 5 minutes, stirring frequently. Slowly whisk in milk; cook about 10 minutes or until thick, whisking frequently. Transfer to bowl of electric mixer. With whisk attachment on low speed, mix in blue cheese. Cool slightly; add egg yolks, one at a time, on high speed. Season with salt and pepper. Cool completely. Whisk egg whites to soft peaks; fold into cheese mixture. Fill ramekins to the top with cheese mixture. Bake in a water bath in 300°F oven for 40 minutes or until lightly browned on top. Cool; unmold onto buttered parchment paper, browned side up. Refrigerate. For each serving, to order, place 2 tablespoons cream and 1 soufflé, browned side up, in small sauté pan. Bring cream to a boil; place pan in 375°F oven 8 minutes or until soufflé has absorbed most of the cream. Transfer soufflé to center of plate. Toss 1 cup salad mix with 4 teaspoons vinaigrette; season with salt and pepper. 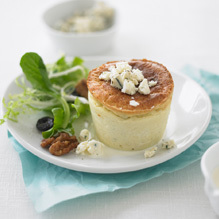 Arrange salad around soufflé; garnish with 4 teaspoons blue cheese and a few cherries and walnuts.